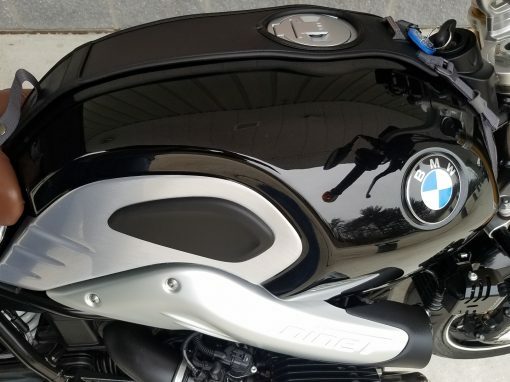 Wow – That’s what this BMW R NineT will make you say when seen in person. 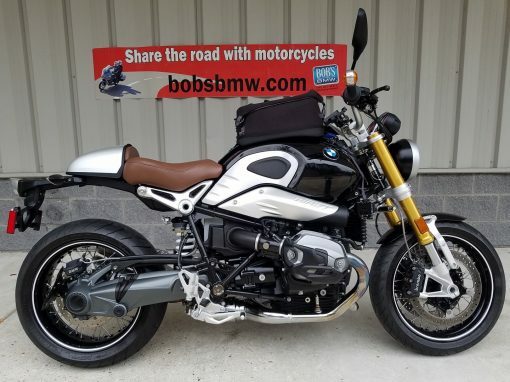 With only 917 miles and really well customized and accessorized, this is basically a BRAND NEW BIKE just looking for someone to take it out and put some miles on it. 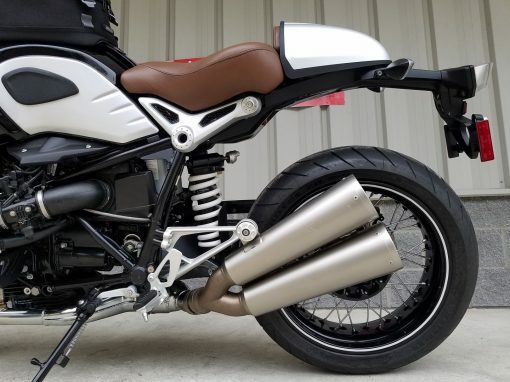 The R NineT, being designed as a high performance naked bike and an almost perfect “cosmetically empty” canvas to allow the owner to make it unique and their own. 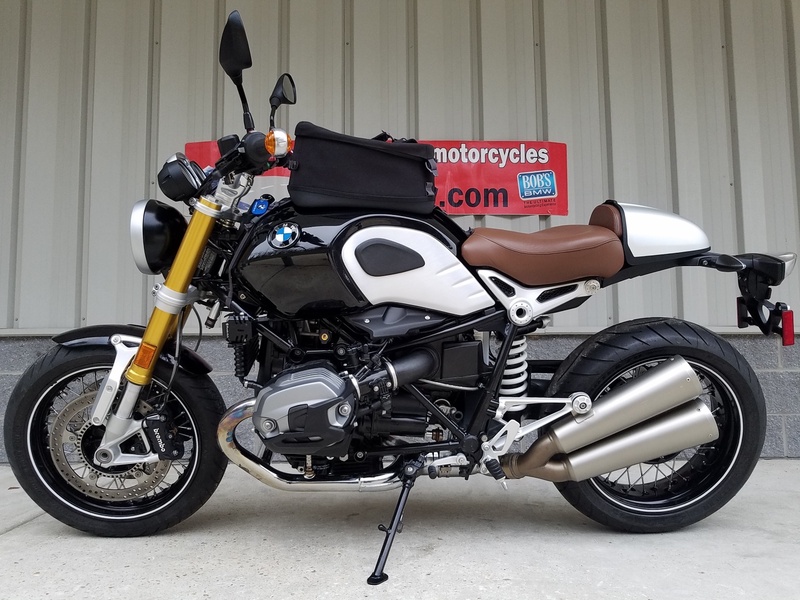 There are a lot of “café racer” type bikes on the market right now and almost all manufactures have at least one model to offer. 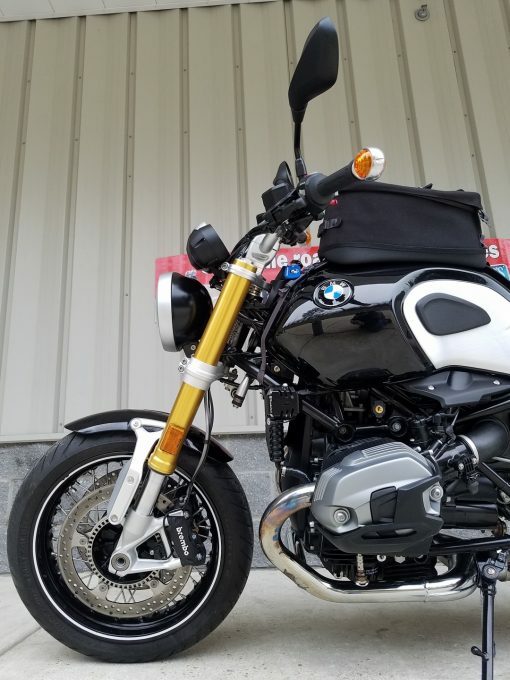 The R NineT is unique in that it’s not a step down in quality. 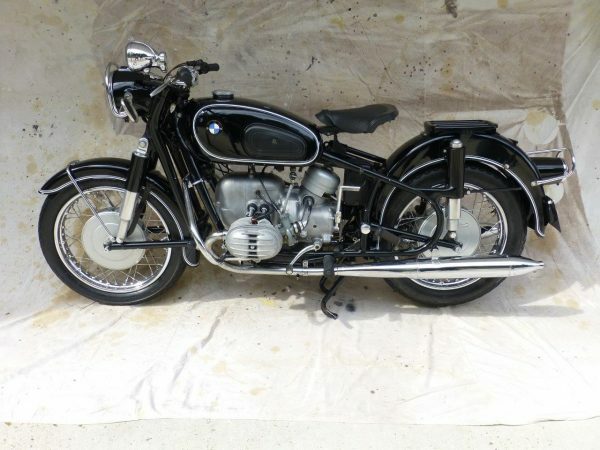 It houses the time tested and very popular R1200 oil and air cooled engine and 6 speed gearbox. It’s equipped with the fantastic upside down forks and single sided Paralever swing arm and single adjustable rear shock which equates to a solid and confidence inspiring suspension. Full performance but stripped down to create a canvas for the new owner to express themselves. The R NineT is a 1170c engine capable of 110 horsepower load of torque. 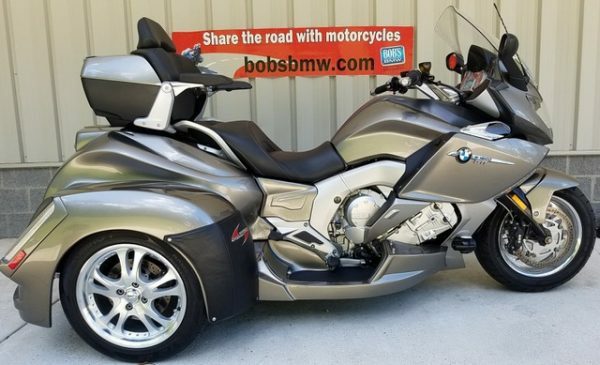 The bikes top speed is listed as 125 miles per hour and weighing less than 500 pounds the weight to power ratio is amazing. This bike moves! It has a 4.8 gallon gas tank that can and this specific tank is the aluminum with sanded weld seam. 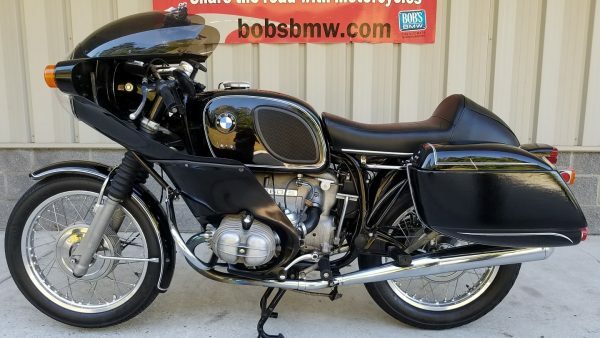 BMW claims 52 miles per gallon. Brembo brakes front and rear and includes BMW’s state of the art ABS system. 17 inch spoke wheels with tubed tires. 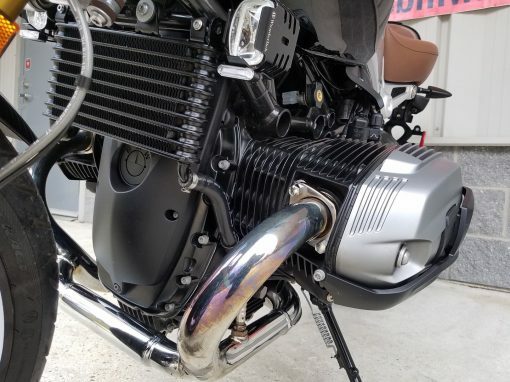 Oh by the way it also comes with the Akrapovic dual mufflers as well which sound great and look the business. The previous owner only put 900 miles on the bike. He does most of his riding on his BMW R1200GS Adventure bikes. This bike was staged in his home and really used as a show piece, an object of art — and it looks the part. The accessories and customization on this R NineT was done very well. Simple, clean and well planned the bike has the café racer look but has some really nice comfort and safety features as well. 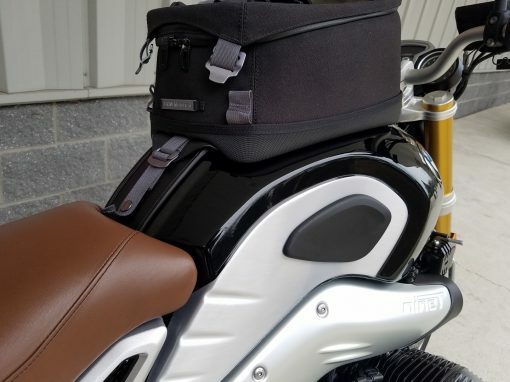 Included in the sale is the BMW tank bag specifically designed for this model. It has the tank strap as well which looks awesome on its own. 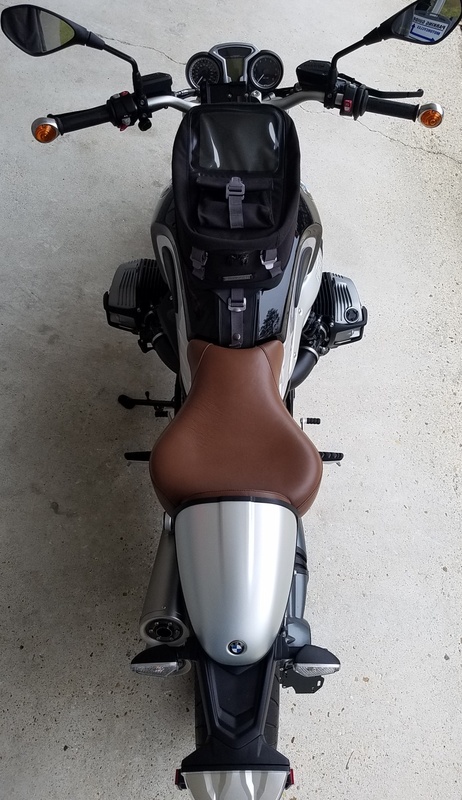 The seat is built on the stock pan but was custom made with additional padding and with a one of a kind brown seat cover. It’s a super comfortable seat and creates a really nice riding position as well. The seat maker also covered the seat hump in matching brown as well. 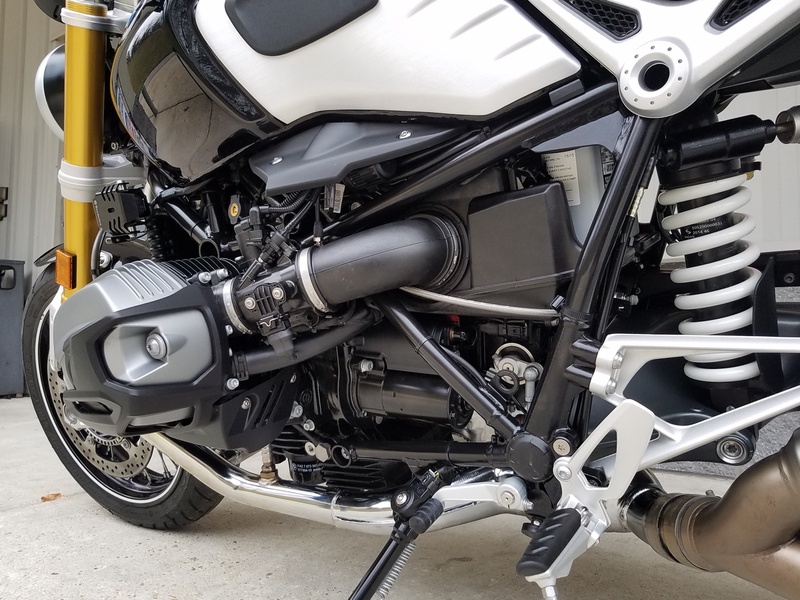 The handlebars are lifted slightly by Wunderlich bar risers which also really complements the seat changes and riding position. 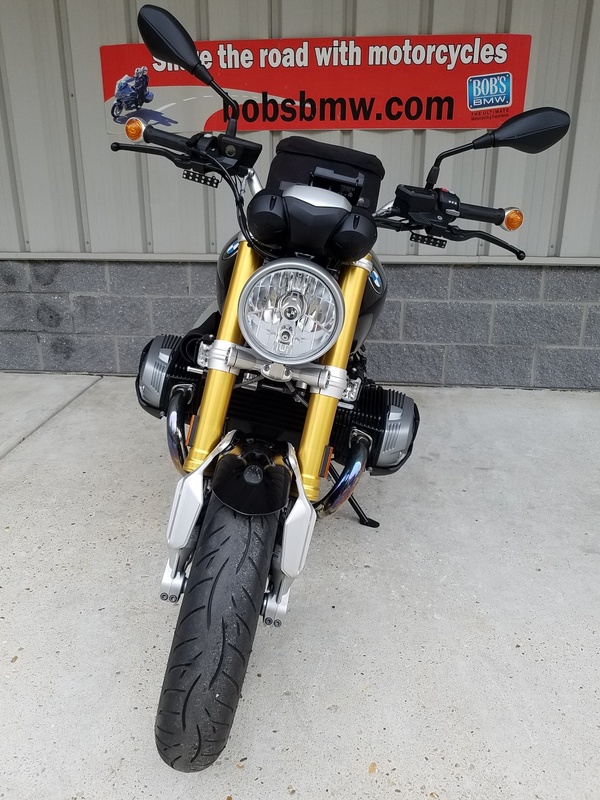 In 2015 the R NineT did not have the heated grip option that was offered later in the year and so the previous owner added the OEM heated grips in 2016 when they became available. There is a bunch of great lighting added to the bike as well. 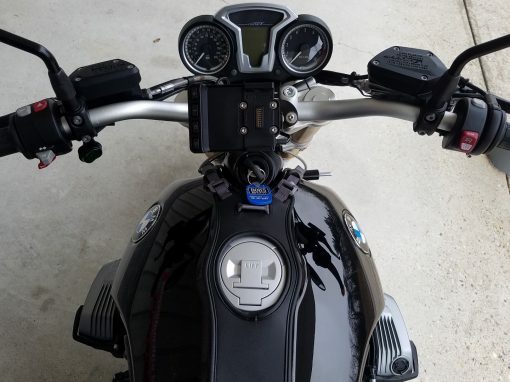 The Wunderlich auxiliary two-stage front lights have been added along with a switch. This allows for a running light and a high beam as well. These look fantastic both on and off. He added a set of Skene Photon Blasters up front which operate as additional turn signals along with the /2 Era style bar end turn signals. These are a great touch. 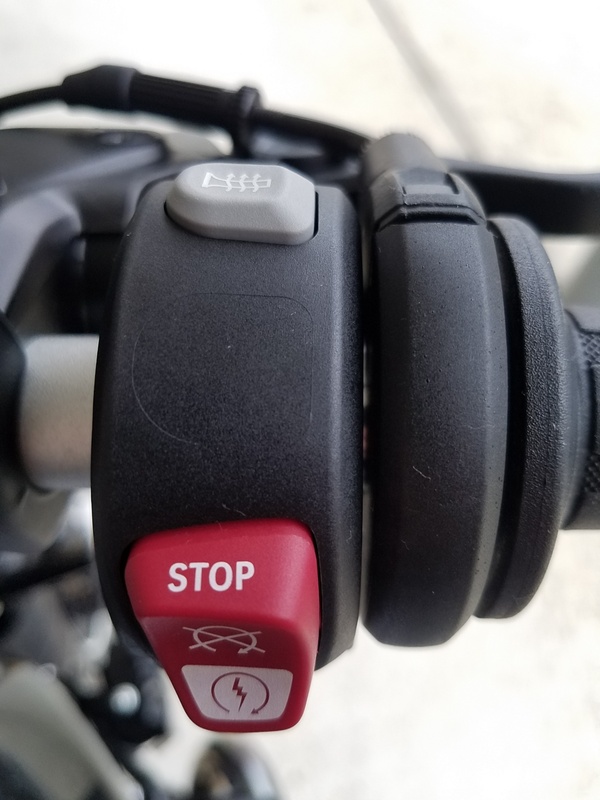 There is a set of Skene P3’s added to the rear which act as an additional brake light and can also be programmed to flash and operate as additional turn signals as well. 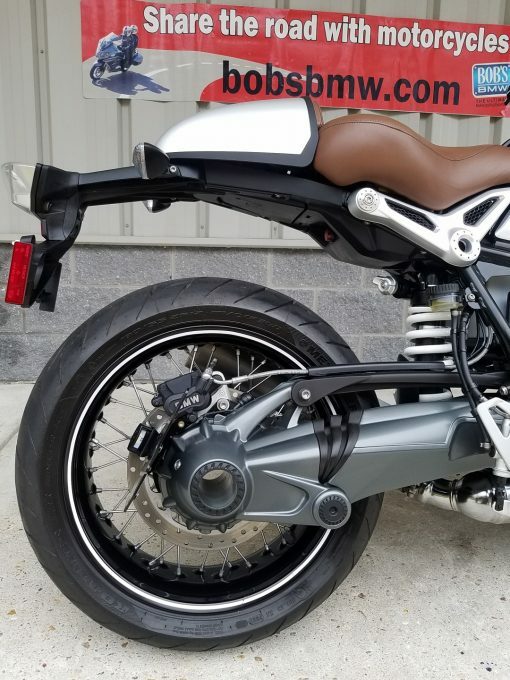 Additionally the previous owner added the BMW café racer style seat hump, valve cover guards and R&G final drive tag mount and light. 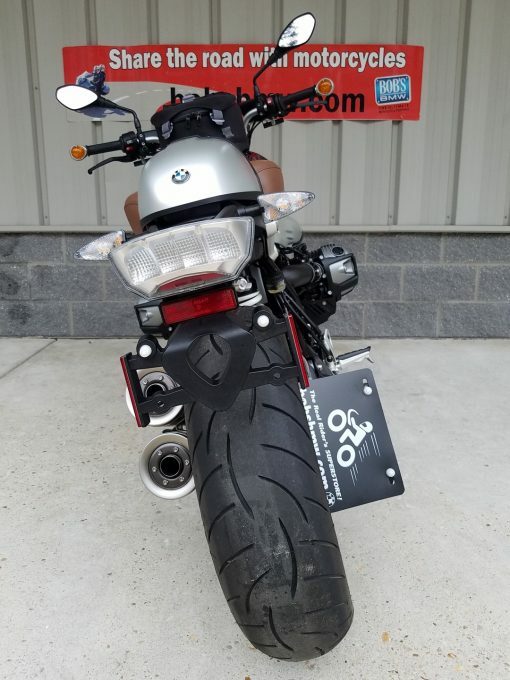 We added the stock rear fender back onto the bike so that it will pass Maryland State Inspection but left the low profile tag mount in place as most customers will want to mount their tag there. Cosmetically the bike is a 9.99 out of 10. The paint looks as clean and sharp as the day it was delivered. This bike, with less than 1,000 miles, was only ridden a couple of times and has never seen rain or salt. The accessories are all in like new condition along with the build quality of the custom seat which is really impressive. The muffler, gauges, controls, etc. all look brand new. This is a great opportunity for someone to take advantage of such a great well cared for bike. Not that it needed much service, but we did take the initiative and do a complete Break-In / Bi-Annual service. We renewed all the fluids included engine oil and filter, brake fluid front and rear, and final drive fluid. We checked the diagnostic computer for faults, reset the service calendar, and completed our full 38 point pre-purchase inspection. 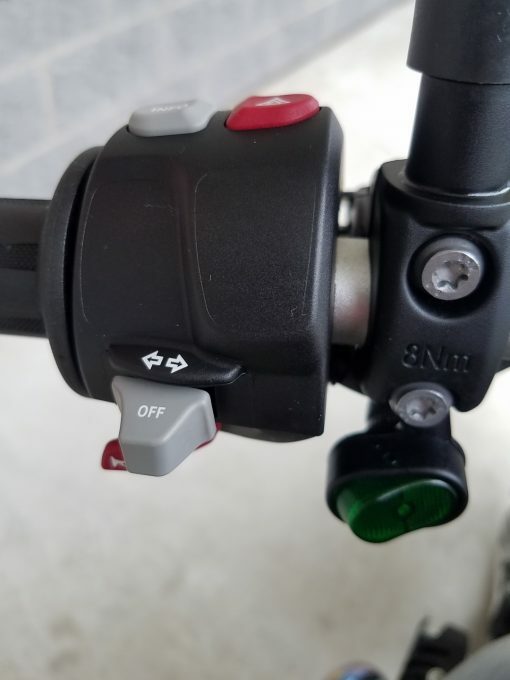 Everything came back with thumbs up so we completed the Maryland State Inspection and did an extended test ride (14 Miles) to insure everything is operating as designed. We then gave the bike to our detailer to prepare the bike for it’s new owner. The bike looks brand new and with only 917 miles it’s as close as you can get to new. 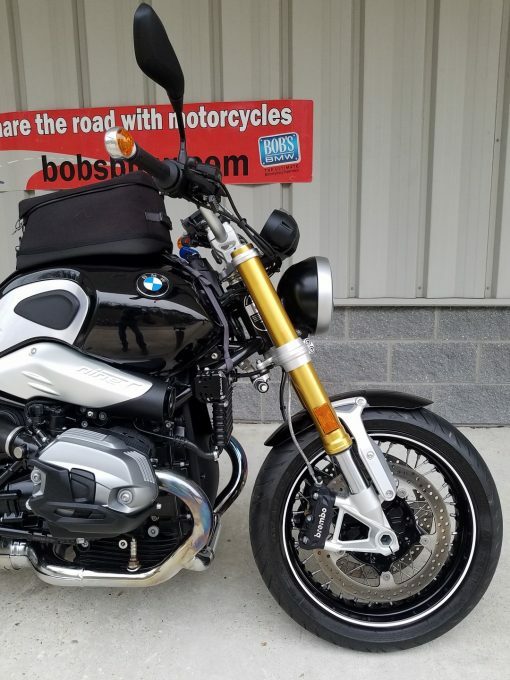 Being fully serviced, with such low mileage, and in such great cosmetic and mechanical condition, this R NineT is a Bob’s BMW Advantage Certified Bike. As a Bob’s BMW Advantage Certified Motorcycle it qualifies for a service loaner at no charge on your first visit plus significant discounts on Tire and Wheel Policy and or a Vehicle Service Contract from Zurich which will continue that no-cost service loaner benefit for the full time period of the policy. It comes with 2 keys, the owner’s manual and factory tool kit. Contact one of our certified BMW sales advisors today!